The future is now! Not only can you heat your side of the duvet to suit you, ensuring a cosy night’s sleep, this ridiculously helpful blankie makes the bed all by itself. We’ve all been there, you’re tucked up into bed and it’s a veritable Goldilocks situation as your side is either too hot or too cold, but annoyingly just right for your sleeping buddy. Ugh. Covers are thrown off or hogged. There’s a lot of huffing and snotty muttering. It seems impossible to ensure that both people in the bed are comfy at the same time. A revolutionary new “smart” product has been developed and it’s sure to turn these sleep wars/bedroom battles on their head. Dubbed the SmartDuvet Breeze Dual-Zone Temp Self-Making Bed (phew! ), it appears to be the answer to all our – climate-controlled and lazy – dreams! “It will keep you cool or warm, and make the bed for you,” the SmartDuvet’s crowd-funding page promises as part of their revenue-raising pitch. 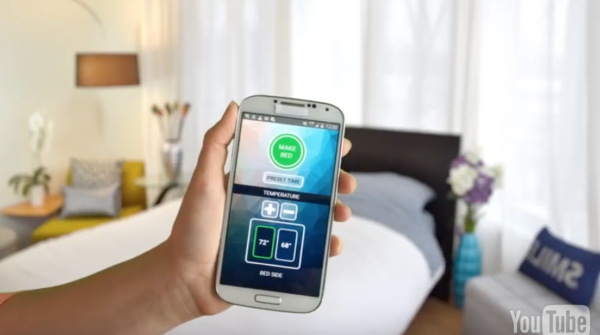 The duvet’s inbuilt climate control for each side of the bed is controlled via an app. Heating or cooling is achieved via a special pad you attach to your existing bedding. Plus, if you’re feeling a little lacklustre and want the bed to (kinda creepily) make itself, the app can sort that out too! It seems that all the tired and housework-hating humans are very excited by this prospect, because it’s raised more than eight times the required funding budget and still has 23 days to go! This means the once-hypothetical product will definitely go into production – and that there is still time to snap up your piece of the sleepy pie! “The new Smartduvet Breeze is the world’s first dual-zone climate controlled self-making bed. The Breeze doesn’t replace your existing bed or bedding, it simply makes them better. In addition to making the bed for you, the Breeze allows you to set your preferred temperature individually for each side of the bed,” its Canadian inventors explained, as doona hogs around the world applauded in delight. It’s reminiscent of some electric blankets that do a similar thing, from underneath, sans app, don’t you think? What’s the damage for such a life-changing, sleep-inducing doona miracle, we hear you ask? Well, for $199US you can snaffle a kit that includes the special Smartduvet layer for your bed, along with all the bits and bobs that make it work and connect to the app. The kit apparently fits any sized bed so we really don’t know what’s stopping you. Go get one, already!